This Excel Disaster Recovery Plan Dashboard Template combines a list of your Disaster Mitigation Plan line items with a striking Impact & Status Dashboard. Provides a simple list to manage your Disaster Mitigation Plans on one worksheet. Focusses on BUSINESS IMPACT, the most efficient and effective way of approaching DRP. Provides IMPACT and LIKLEHOOD score entry, and assigns as SEVERITY score automatically. Provides a Dashboard for management reporting. This template provides an extensible list for all of your Disaster Mitigation Plans, also known as Business Impact Line Items. For each DRP Line Items and categorises the Severity, Probability, Mitigation, together with the status of each plan. 2. 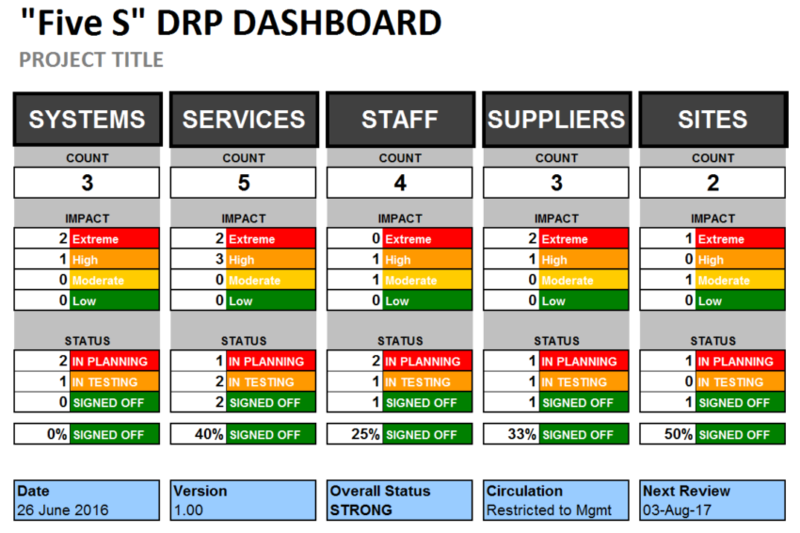 Your “Five S” Disaster Recovery Plan Dashboard. Ideal for Boardroom Status Reporting! All line items are summarised into a simple dashboard. Excel Disaster Recovery Plan Line Items worksheet. Present your Disaster Mitigation Strategy with this Powerpoint Disaster Recovery Plan Presentation Template. Keep it simple, focused, and look good. How do I write a Disaster Recovery Plan?